*Power tools and small appliances qualify for a 10% discount. LIMIT ONE BAG AND ONE OFFER REDEMPTION PER CUSTOMER. 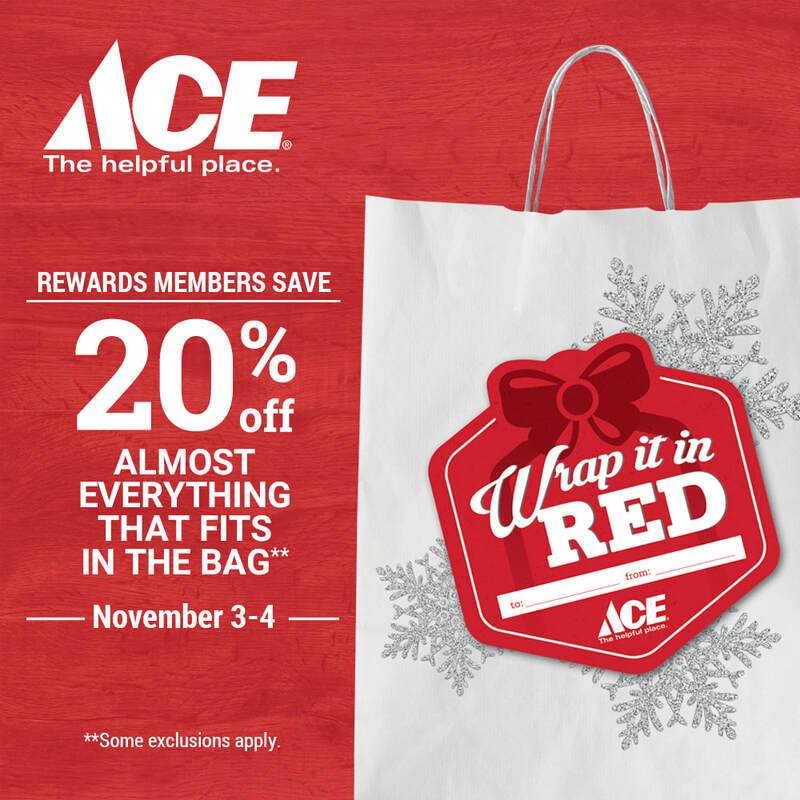 Coupon good only at participating Ace Hardware stores. Offer valid November 3 & 4, 2018, only. Discount applies to the regular price of in-stock merchandise that can fit inside the bag at one time. Merchandise placed in the bag must remain in its original packaging. No rain checks will be given. In-store discount does not apply to acehardware.com, in-store pickup orders, phone orders, and special orders or store charge accounts. Discount not valid on: Ace gift cards, city stickers, garbage tags and lawn/trash bags, lumber and building materials, fuel, previously purchased merchandise, Benjamin Moore®, Magnolia Home™ paint, Weber® branded products, Nest branded products, STIHL® branded products, Toro® branded products including select power tools and power equipment, YETI® branded products, Traeger® branded products, Big Green Egg® branded products, water heaters, grills, and other items that each participating store may designate, or in conjunction with any other coupon, excluding Rewards. Additional exclusions may apply. See store for additional details. Offer good in USA except where prohibited or otherwise restricted by law.